A conservative group took credit for a barrage of anti-net neutrality comments posted on the U.S. Federal Communications Commission's website this week, but it denied generating fake activism. TheÂ Center for Individual Freedom said it did not use a bot to generate comments after news reports raised questions about the legitimacy of the posts. Between Monday and early Wednesday afternoon, the FCC had received more than 128,000 comments duplicating the language provided by CFIF. Five people whose names and addresses are attached to the anti-net neutrality comments denied posting them when contacted by reporters at ZDNet and TheVerge.com. At this point, it's unclear how many of the 128,000 comments were legitimate and how many were fake, and no one has determined how any fake comments were generated. Making a fraudulent statement to a U.S. government agency is a crime, with a maximum sentence of five years in prison. CFIF said it has encouraged people to post comments, using its language, through a web-based form. Groups on both sides of the FCC net neutrality debate have employed similar web-based mass comment campaigns in recent years, and the agency accepts those comments, even as some critics question their value. "CFIF is not using bots or any other automated tool to generate comments," a representative of the group said by email. "CFIF's effort requires people to opt-in by manually signing, confirming, and submitting their comment for delivery to the FCC. There are several safeguards in place to ensure the integrity of the opt-in process." The CFIF campaign follows a similar effort by comic and commentator John Oliver, who encouraged views of HBO's "Last Week Tonight" to submit their own comments in support of net neutrality rules passed by the FCC in 2015. Oliver objected to new FCC Chairman Ajit Pai's recent proposal to kill the regulations. As of Tuesday night, more than 1,700 people had submitted comments using the name John Oliver, and more than 600 had used the name "1," the Washington Free Beacon reported. A handful of racist comments targeted Pai's Indian heritage. The apparently fake comments using the CFIF language, as well as the 1,700 people who submitted comments as John Oliver, demonstrate a weakness in the FCC comment system, and perhaps, in mass comment campaigns. 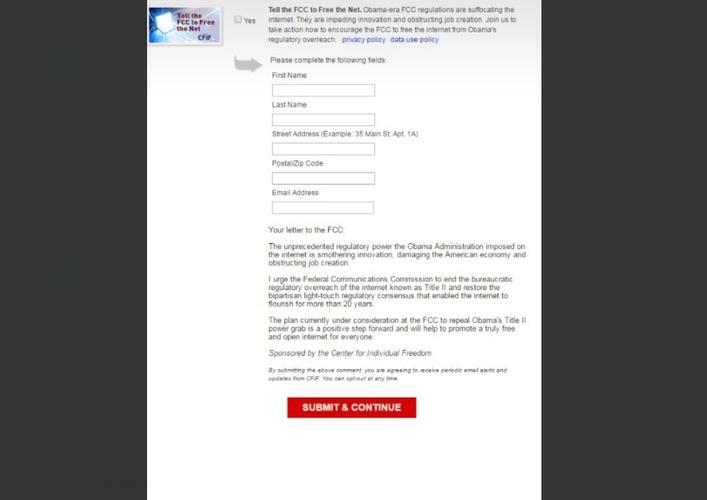 The FCC comment system requires a name, email address, and physical address, but makes no other attempt to determine if comments are legitimate, and it appears that some web activism campaigns have the same holes. An FCC spokesman declined to comment on the agency's comment system Wednesday. As of late Wednesday, the FCC had received more than 733,000 comments on Pai's proposal to scrap the 2-year-old net neutrality rules. The search functionality on the FCC's comment site didn't appear to be working for most of Wednesday afternoon. During the FCC's 2014-15 debate on net neutrality, it received more than 4 million public comments, a majority in support of strong regulations. Many of those comments were generated using web-based mass comment campaigns, however.